Lynda Nead of the University of London will speak April 14 on “The Tiger in the Smoke: The Aesthetics of Fog in Post-War Britain c. 1945-55” as part of a series of Earth Month events at Wesleyan. In honor of Earth Month, Wesleyan will host a series of speakers and films beginning April 14. At 4:15 p.m. on April 14, the College of the Environment will present a talk, “The Tiger in the Smoke: The Aesthetics of Fog in Post-War Britain c. 1945-55,” by Lynda Nead, the Pevsner Professor of History of Art at Birkbeck, University of London. The talk will be in 41 Wyllys, Room 112. It is cosponsored by the Allbritton Center for the Study of Public Life; the Mellon Fund for Lectures in Ethics, Politics and Social Issues; Art History; History; and the Science in Society Program. The event is free and open to the public. 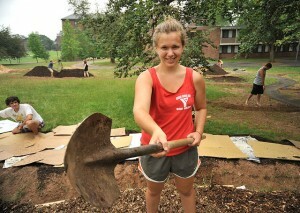 Throughout April, Wesleyan is hosting its second annual Earth Month. 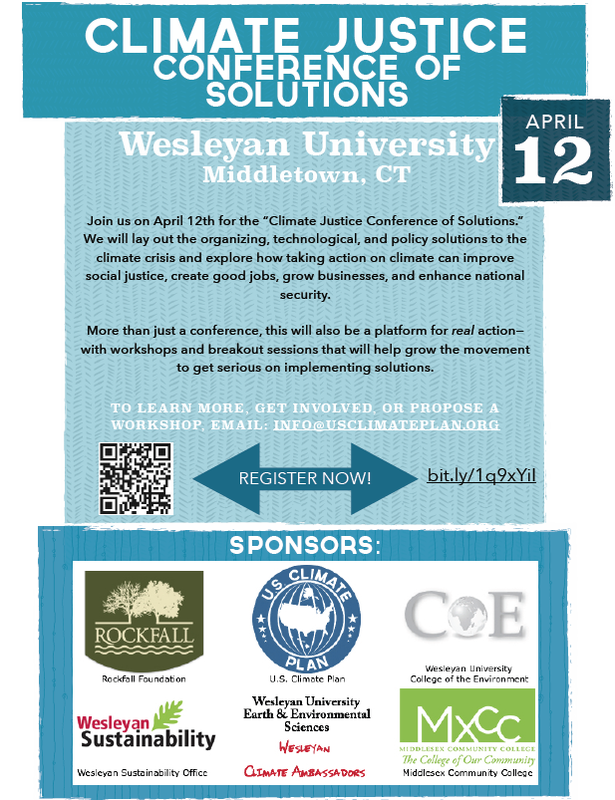 Click this icon to view the “Climate Justice Conference of Solutions” poster. 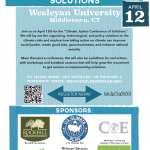 On April 12, Wesleyan is hosting a “Climate Justice Conference of Solutions” event. Participants will lay out the organizing, technological, and policy solutions to the climate crisis and explore how taking action on climate can improve social justice, create jobs, grow businesses, and enhance national security. Register for the event here. 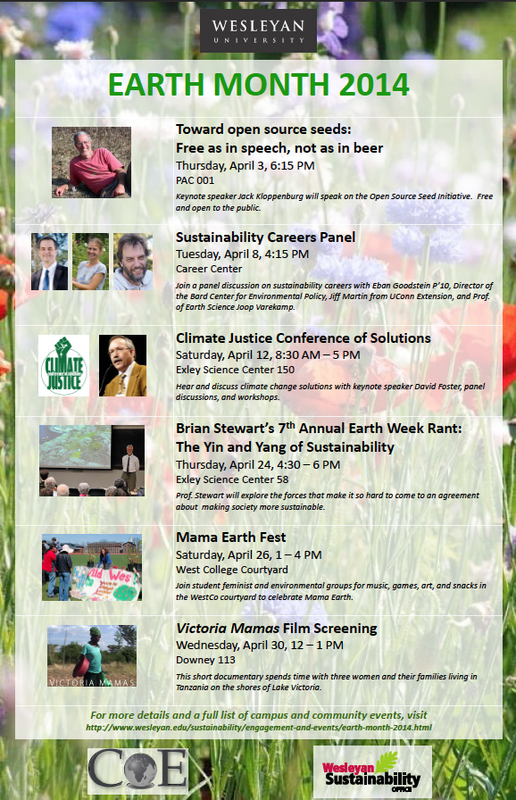 Other Earth Month events include a Sustainability Career Panel on April 8, Long Lane Farm grand workdays, WILDWes workdays, a Wesleyan Joulebug Competition, an Earth Week Rant with Professor of Physics Brian Stewart, a Mama Earth Fest, a film screening of Victoria Mamas and more. 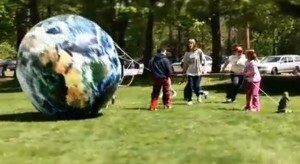 Earth Month is sponsored by Wesleyan’s Sustainability Office and the College of the Environment. 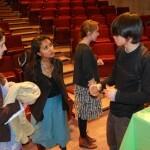 Wesleyan’s Sustainability Office hosted several earth-friendly opportunities in honor of Earth Month. 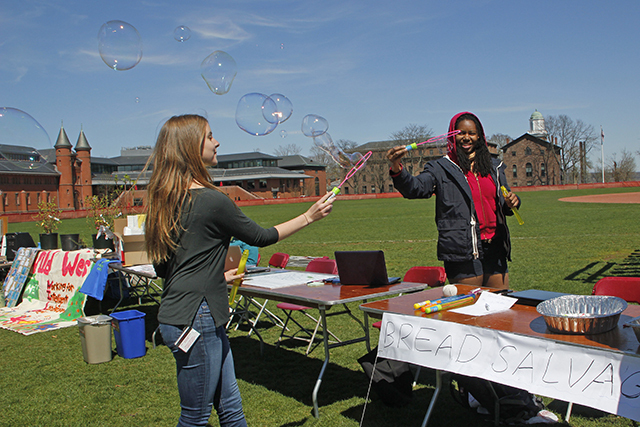 On April 21, students from the Bread Salvage group promoted their organization during Earth Fest, a music and food festival on Foss Hill. Join WILD Wes from noon to 4 p.m. on April 6 and April 27 to plant understory berry bushes and herbaceous plantings in the West College Courtyard. 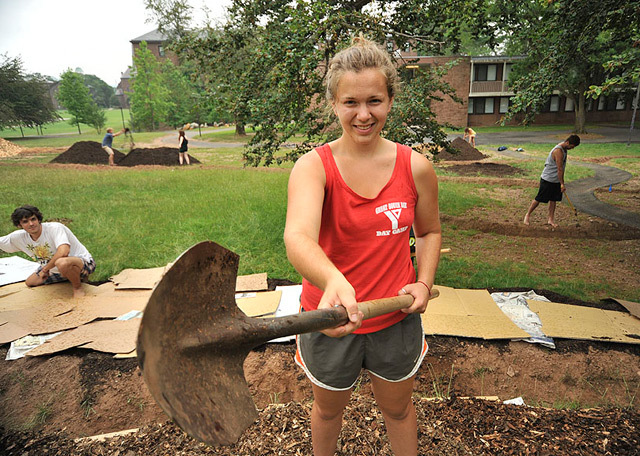 Plant trees, create recycled art, tour a chestnut orchard, work on an organic garden and much more during Earth Month at Wesleyan! During the month of April, Wesleyan’s Sustainability Office is hosting several earth-friendly opportunities. Events begin April 4 with a luncheon discussion on “Waste: Uncertainty, Futurity, and Democratic Engagement” at Woodhead Lounge. The Wesleyan community also is invited to the 6th Annual Global Environmental Sustainability Symposium on Transportation, Human Mobility and Sustainability at Central Connecticut State University the same day. On April 6, join student organization WILD Wes to plant the berry bushes and herbaceous plantings for the Edible Forest Garden. Planting takes place in the West College Courtyard. On April 9, Michigan-based folk musicians and environmental activists Samuel Seth Bernard and May Erlewine will participate in a performance and conversation over a vegan dinner for Wesleyan students, faculty and staff. Bernard and Erlewine have been perennial attractions at the Earthwork Collective farm’s annual Harvest Gathering, a music festival devoted to local independent artists and responsible, earth-friendly activism. The dinner takes place at Daniel Family Commons. The English Department will present a panel discussion on “Green English: Nature and the Literary Humanities,” in honor of the works and career of William Stowe at 4:15 p.m. April 18. 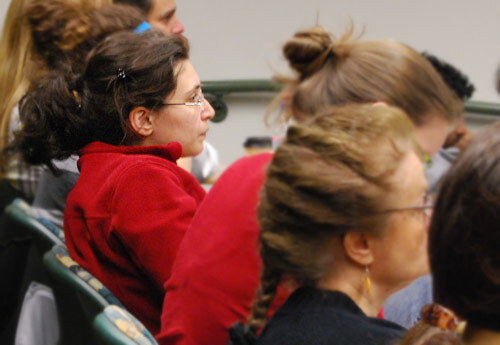 Presenters are Lois Brown, professor of English, professor of African American studies; Stephanie Weiner, associate professor of English; and Courtney Weiss Smith, assistant professor of English. 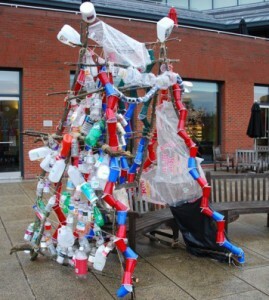 The Recycled Art Competition takes place April 19 at the Usdan University Center’s Huss Courtyard. 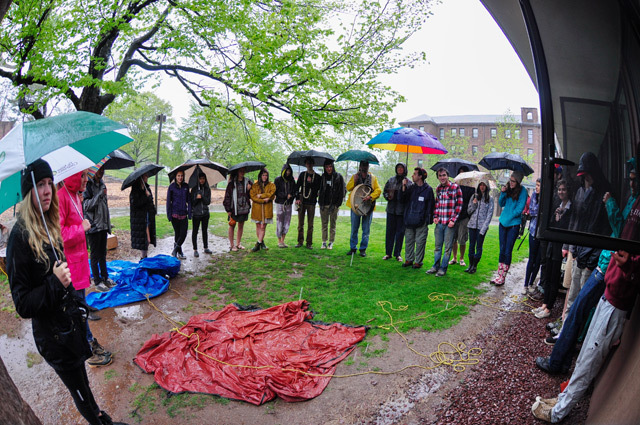 On April 19, view the Recycled Art Competition at the Usdan University Center’s Huss Courtyard, and on April 20, join students at Wesleyan’s Long Lane Farm to work in the organic garden. On Earth Day, April 22, Juliet Schor ’75, professor of sociology at Boston College will speak on “Treading Lightly on the Earth: the Practice of Plenitude” in the Public Affairs Center. In this talk, Professor Schor will discuss the emergence of “plenitude,” a set of new practices, networks and ways of living that emphasize eco and carbon footprint reduction, sharing, self-provisioning, and reduced engagement with the “Business As Usual” economy. Schor will draw on research from a series of case studies across a range of places and communities. 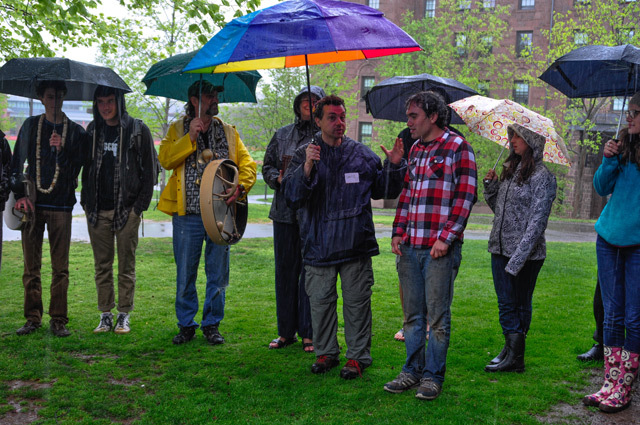 Earth Month events will wrap up with a Sustainable Transportation Think Tank on April 24; the 6th Annual Earth Week Rant on April 25; an Arbor Day tree planting and Earth Day Veg Out on April 26; a North End spring cleaning and WILD Wes work day on April 27; and a Sustainability Poetry Slam and workshop on May 2. Other Earth Month events include an Environmental Action Conference, Bike Walk Summit, residential waste audits, an Earth Day 5K, a Wild and Scenic Film Festival, Middletown Chestnut Orchard tour and more. For more information on these events and to register, see the Sustainability Office’s web site. 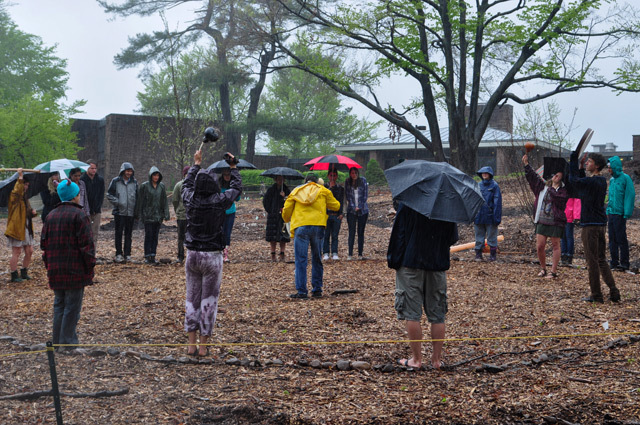 Feet to the Fire: Exploring Global Climate Change from Science to Art was an 18-month project which included research opportunities for a team of students and faculty to explore first-hand the effects of global warming. 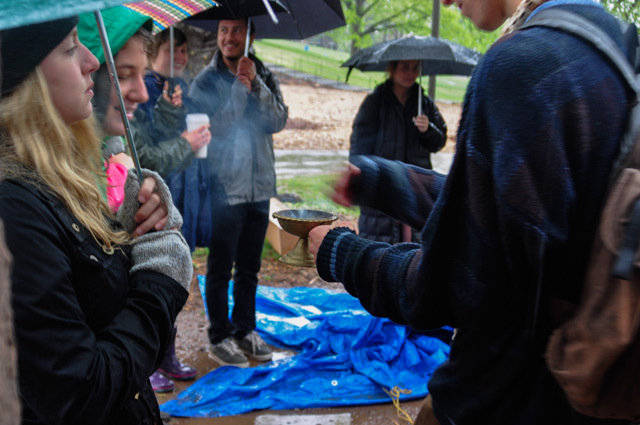 Feet to the Fire included an eco-arts festival in a neglected city park. 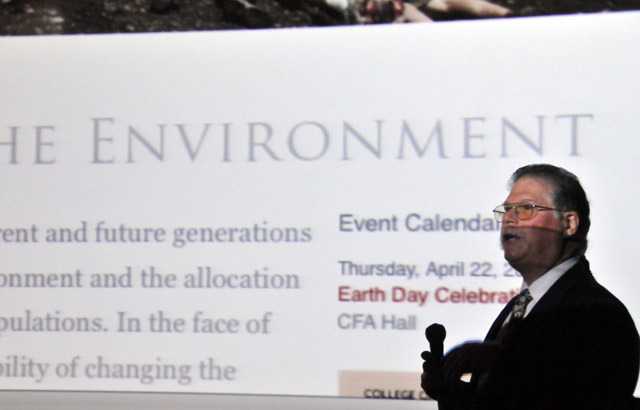 “Keeping Our Feet to the Fire: Joining Art and Science to Engage Environmental Issues” is the topic of Wesleyan’s 2010 Earth Day celebration on April 22. The event will feature a world premier screening of Paul Horton’s film Connections within a Fragile World. A panel of environmental experts will discuss the question “are art and science as natural allies in communicating environmental issues to the public?” It will be moderated by Jeremy Isard ’11, with panelists: Godfrey Bourne, University Missouri St. Louis; Marda Kirn, EcoArts Connections, Colorado; Cassie Meador, Liz Lerman Dance Exchange, Washington, D.C.; and Barry Chernoff, the Robert Schumann Professor of Environmental Studies, professor of biology and director of the Environmental Studies Certificate Program at Wesleyan. The Schumann Prize for Distinguished Environmental Stewardship will be awarded to a member of the class of 2010 and a reception will follow the event. 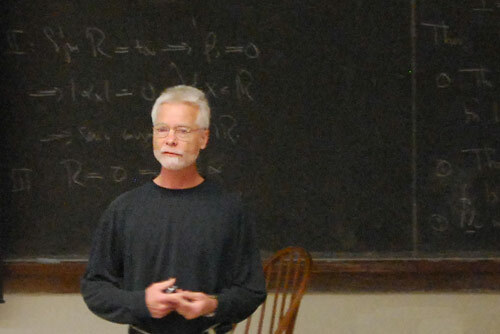 Brian Stewart, associate professor of physics, led this second annual "Earth Week Rant" April 23 in Exley Science Center. 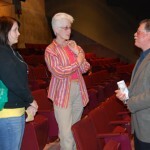 The event was open to the Wesleyan and broader communities. 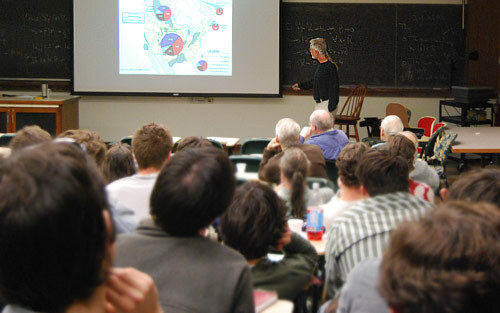 Stewart focused his "rant" on the connection between resource depletion, pollution including global warming, and population growth. Here, Stewart discusses the Canadian and U.S. natural gas resources and reserves. Eco-activist. 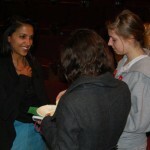 filmmaker and reality television star Shalini Kantayya spoke about the global water crisis during Wesleyan’s Earth Day Celebration April 15. Her production company, 7th Empire Media, is committed to using media to give a powerful voice to the unheard. Kantayya captured the attention of the nation during the television series “On the Lot,” a reality show created by Steven Spielberg for the purpose of finding Hollywood’s next great director. Out of over 12,000 filmmakers, Kantayya was the only woman to finish in the top 10. 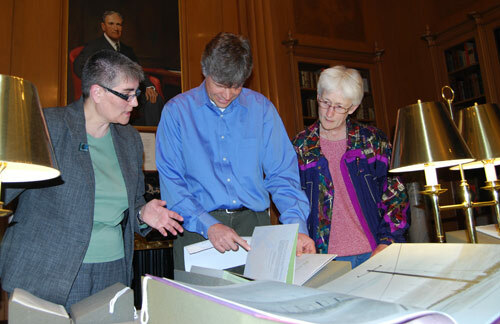 At left, Suzy Taraba, university archivist and head of Special Collections, speaks to Phil Resor, assistant professor of earth and environmental sciences, and Suzanne O'Connell, chair and professor of earth and environmental sciences, director of the Service Learning Center, during the Special Collections and Archives Earth Day Open House April 22. Taraba is explaining printer and publisher Robin Price's 43 Paper maps from locations along the 43rd parallels are bound in an accordion that structurally supports the main text, which is printed on graph paper and joined together as an accordion. 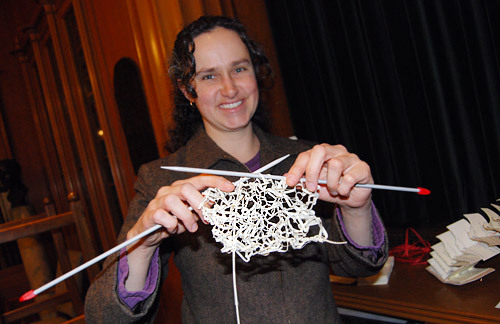 Rebecca McCallum, cataloging librarian at Olin Library, used old cataloging cards to knit this "fabric," which was on display at the Earth Day event. Several Olin library employees created recycled art for the open house. 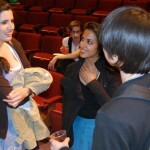 Filmmaker Shalini Kantayya is Wesleyan's Earth Day Celebration keynote speaker April 15. Through film, eco-activist, and reality television star Shalini Kantayya will speak about the global water crisis during Wesleyan’s Earth Day Celebration April 15. The event begins at 7:30 p.m. in the Center for the Arts Cinema. Kantayya will discuss her film, “a DROP of LIFE”, which will be viewed following her presentation. “a DROP of LIFE,” is a futuristic sci-fi flick about the mounting global water crisis. It has been used by The African Water Network as an organizing tool in over 40 villages across Africa, and has been screened at festivals worldwide, winning the Best Short Film at Palm Beach International and Audience Choice Award at the IUOW Film competition.